Chris retired from serving worldwide for 23+ years in the Marine Corps infantry and settled down in Columbus, Montana. In 2003 Chris got his guide's license and his outfitter's license in 2008, which allowed him to expand the scope of his Columbus based guiding business. In 2011, Chris opened Stillwater Anglers in Columbus; expanding his outfitting business to include a retail fly shop. Rob is a retired Marine and passionate fly fisher. Since retiring from the Marine Corps, Rob has been working as hard as he can to ensure new, experienced, young, or old have a great fishing trip on the river or lake. Ben has been one of Stillwater Angler’s regular Montana fly fishing guides since 2015. 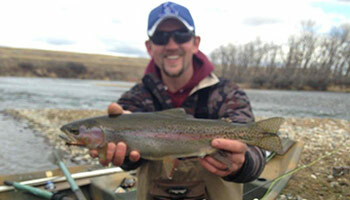 He has been a licensed fly fishing guide since 2011, with over 600 guide days logged. Ben has led classes on "Streamer Fishing" to help make more Streamer Junkies, like himself. Matt Wilhelm’s passion for fly fishing began at age 11, and he spent his life learning the sport of fly fishing and sharing it with others . Matt is the former National Education Coordinator for the Federation of Fly Fishers (FFF). Tyson was born and raised in Montana. He grew up fly fishing the Montana and Wyoming rivers and springs, having caught the fly fishing bug at the young age of 13. Tyson enjoys to teach novice anglers the many aspects of fly fishing as well as guiding seasoned fishers looking for more technical waters. J.D. became a regular Stillwater Angler guide in 2016. He grew up right here in Columbus, Montana. He’s been fishing the Yellowstone, Stillwater, Rosebud, and Boulder rivers for over 25 years, and the Bighorn and upper Missouri River for over 15 years. Seth has spent the last decade guiding anglers on the Yellowstone and Bighorn rivers in Montana and also spent extensive periods of time guiding in both Alaska and Chilean Patagonia. For Luke it was not only enough to call Columbus, MT home; he found the waters of the Stone and Stilly to be just as accommodating. Luke has lived his entire life in Yellowstone Valley, only leaving to earn a degree in education from Montana State University-Bozeman. Gayle became a licensed Montana fly fishing guide in 2008, and joined the Stillwater Anglers’ team in late 2013. She specializes in walk and wade trips on the Stillwater, Boulder and Bighorn for our women clients. 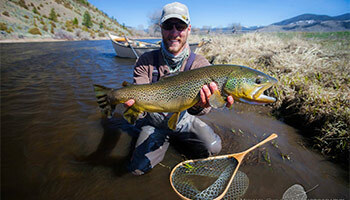 Stillwater Anglers is proud to offer the finest Montana fly fishing guides in the region. You won't find any rookies or “shop dudes” here. 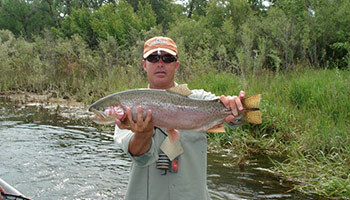 Our team of fly fishing guides are made up of only the most experienced, seasoned, and licensed guides. Stillwater Anglers’ owner and outfitter, Chris Fleck, put together this top-notch team of guides to fulfill his promise to provide you with a great fly fishing experience, whether you’re a novice angler or a seasoned fly fisherman. Chris, himself, tries to guide as many trips personally as he can, but because he also manages the Fly Shop, he has curated an amazing team of Montana fly fishing guides to take you on an amazing guided fly fishing experience. If you have a preference for a particular guide, let us know when you book and we'll do our best to accommodate you. 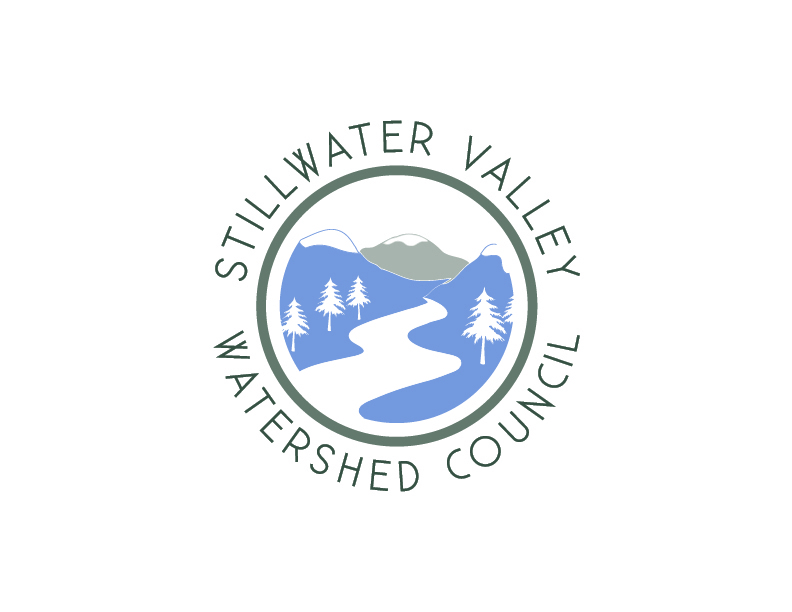 We are always looking for additional highly qualified independent contractor guides and outfitters to join our Stillwater Anglers team. We use IC outfitters and guides only. ICs are expected and required to provide their own boat, client gear, and tackle, be familiar with local waters and be able and equipped to conduct both float and walk/wade trips. While initially, opportunities may be limited to large trips or last minute bookings, there will be more trips for those who have the flexibility and are available at the last minute. We pay the top gross wage for our guides. As an IC, you are required to provide flies and terminal tackle for client use. ICs also provided their own drinks and lunches as well as shuttles. The exception to this is a group trip, where lunches may be provided and the cost deducted from the gross wage. All of our guides receive a discount on all retail merchandise, are eligible for shop dealer discounts and promotions, and receive free ice for their trips with us. We are also always interested in finding additional IC guides who can conduct trips outside of our immediate area on the upper Yellowstone, Spring Creeks, Madison, Missouri or other rivers. Contact us you'd like to be added to our list. We will require meeting you in person along with obtaining copies of all relevant licenses and documents. We will need to endorse your license as well as have you complete a guiding agreement and W9 form. We will also generally want to fish with you a day or two as well if possible before signing you on. Letters of recommendation from outfitters we know are also helpful. Chris retired from serving worldwide for 23+ years in the Marine Corps infantry and settled down in Columbus, Montana. In 2003 Chris decided to parlay his passion for the sport of fly fishing into a business, getting his guide's license and creating Semper Fish and Guide. In 2008, he went on to achieve his outfitter's license, which allowed him to expand the scope of his Columbus based guiding business. In 2011, Chris opened Stillwater Anglers in Columbus; expanding his outfitting business to include a retail fly shop. It’s very apparent that Chris has brought with him the same commitment and dedication that served him in his previous career to his new business. 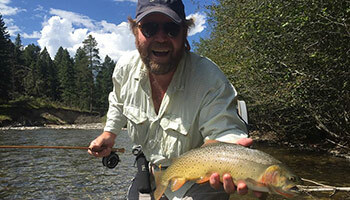 Chris has been active with several fly fishing and conservation related organizations in Montana. He has served as Chapter President and Board Member for Magic City Fly Fishers, the local Trout Unlimited Chapter. He has also served on the State Council for Trout Unlimited and on the Board of Directors for the Fishing Outfitters Association of Montana. Chris has a passion for the sport of fly fishing and enjoys nothing more than sharing a day out on the river with his clients. 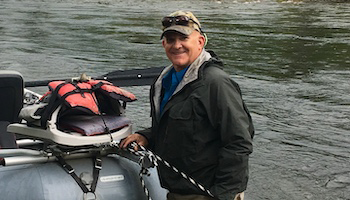 As owner of Stillwater Anglers, Chris is dedicated to providing personalized customer service and helping his clients enjoy a complete quality fly fishing experience from their time at the Fly Shop to their time on the Montana rivers. Stillwater Anglers is pleased that Ben has been one of Stillwater Angler’s regular Montana fly fishing guides since 2015. Affectionately nicknamed “Trout Fisher Ben” or “TFB”, Ben has been fishing trout since he was a little boy growing up in Pennsylvania. 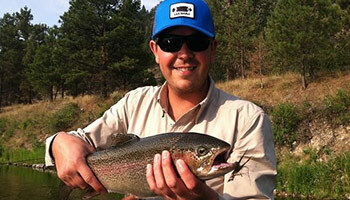 Ben has been a licensed fly fishing guide since 2011, with over 600 guide days logged. He is a member of FOAM, Trout Unlimited, and a Streamer Fishing Expert. Ben has led classes on "Streamer Fishing" to help make more Streamer Junkies, like himself. Having grown up fishing beside Potato Creek in north central Pennsylvania near the Allegheny National Forest, Ben first learned how trout behave. Ben was able to further his fly fishing skills while attending college near Erie, PA; fishing Lake Run Steelhead on a fly rod. 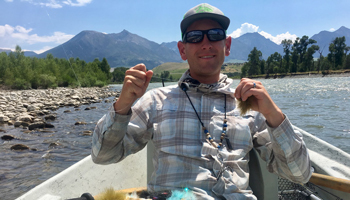 After graduating college with an Education Degree, Ben moved to southwest Montana to work as a fly-fishing guide. He spent many days on the Bitterroot, Rock Creek, Clark Fork, and Big Hole rivers and Rock Creek. Ben also spent three years working and guiding out of Durango, Colorado where he guided on the famous Animas River, the nearby San Juan River, and several mountain creeks in the area. Currently, Ben lives in Montana and is his days on the Yellowstone, Stillwater, Boulder, and Big Horn rivers guiding for Stillwater Anglers. As a fellow retired Marine, and passionate fly fisher, it’s no surprise that Rob and Stillwater Angler’s owner and outfitter, Chris, enjoy working as Montana fly fishing guides together. The two enjoy breaking away for a cup of coffee to talk “Marine” life or for a day or two every season to fish together! Since retiring from the Marine Corps, Rob has been working as hard as he can to ensure new, experienced, young, or old have a great fishing trip on the river or lake. Rob has been fishing the Bighorn River since 2006, but also guides the Missouri and Stillwater Rivers. Rob is passionate about both fly fishing and Montana and strives to make sure every client has a FUN and memorable Montana fly fishing experience. Rob has been a been a regular guide for Stillwater Anglers for a few years now and really enjoys taking beginners and seasoned anglers out onto the Montana waters. Rob has such a great time and really enjoys taking his clients on full day adventures on the Bighorn River. His calendar fills up rather quickly, so we recommend booking with Rob well in advance. Matt Wilhelm’s passion for fly fishing began at age 11 on the banks of the Manistee River in Northern Michigan. Since then Matt has spent his life learning the sport of fly fishing and sharing it with others . Matt is the former National Education Coordinator for the Federation of Fly Fishers (FFF). His duties for the FFF included planning and implementing fly fishing and aquatic education programs on a local and national level. Matt is now the Director of Education for the Invasive Species Action Network. His duties include developing educational materials and programs that focus on stopping the spread of aquatic nuisance species and keeping our waters healthy. 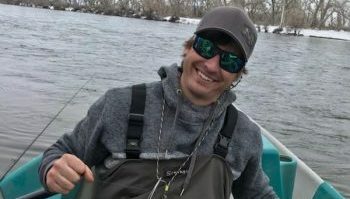 He also is the fly fishing coordinator for Montana’s Hooked on Fishing program where he plans and implements fly fishing education programs that reach close to 7,000 kids per year statewide. For his efforts, Matt was named Montana Fisheries Educator of the Year by the Montana Chapter of the American Fisheries Society. Matt has been an FFF Certified Casting Instructor since 2000 and obtained his Master Certified level in 2006. Due to the success and unique nature of Matt's fly fishing education programs, he has been featured on ESPN on two separate occasions. His fly fishing education programs give students the tools and experience they need to be skilled, successful, and ethical fly anglers. Tyson was both born and raised in Montana. He grew up fly fishing the Montana and Wyoming rivers and springs, having caught the fly fishing bug at the young age of 13. Tyson’s passion for fly fishing has taken him beyond Montana and Wyoming and have allowed him to experience fly fishing adventures in Louisiana and the Yucatan. Stillwater Anglers is happy to have Tyson on their list of regular guides. The lower Yellowstone and its tributaries along with the Bighorn river have been the destination for most of Tyson’s angling days. Tyson enjoys to teach novice anglers the many aspects of fly fishing as well as guiding seasoned fishers looking for more technical waters. James (known by all as “J.D.”) became a regular Stillwater Angler guide in 2016. J.D. grew up right here in Columbus, Montana. With both passion and experience on the local waters, Stillwater Anglers is pleased to have J.D. as one of our Montana fly fishing guides. 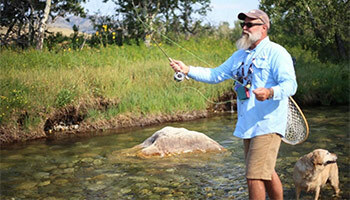 He’s been fishing the Yellowstone, Stillwater, Rosebuds, and Boulder rivers for over 25 years. For over 15 years, J.D. has also been angling on the Bighorn and upper Missouri River. J.D. loves fishing but also is passionate about conservation. His love for both is what lead him to become a fly fishing guide. He feels so blessed to get to share his passion for fishing with others and thoroughly enjoys teaching conservation methods to help preserve the natural resources we are so lucky to enjoy. Like most of our guides, J.D. is an independent contractor who works for various outfitters. We are excited and honored to have him on our staff and for our clients to learn from. J.D brings a lot of knowledge, experience, and passion to each and every guided fly fishing trip he’s on. Seth grew up in Billings, MT and cut his teeth by learning to fly fish on the nearby Stillwater River. He bought his first drift boat at age 14 and started his guiding career on the Bighorn River at age 18. Seth has spent the last decade guiding anglers on the Yellowstone and Bighorn rivers in Montana and also spent extensive periods of time guiding in both Alaska and Chilean Patagonia. Whether you want to throw technical dries for rising trout on the Bighorn, or chase the fish of a lifetime on the Yellowstone, Seth is the man for the job. Gayle joined the Stillwater Anglers’ team in late 2013. Gayle specializes in walk and wade trips on the Stillwater, Boulder and Bighorn for our women clients. She enjoys sharing her passion for the great outdoors and fly fishing with men and women of all ages. 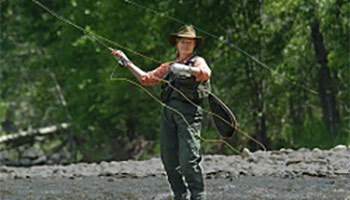 Gayle became a licensed Montana fly fishing guide in 2008. Since then, she has been both a guide and and a fly fishing instructor at Montana State University-Billings. Gayle is the former owner of Montana Troutfiters in Bozeman and co-founder of the Casting for Recovery Montana Trailhead chapter. Prior to starting her fly fishing career 20 years ago, Gayle was a spin caster along the banks of Crab Orchard and Devil's Lake in southern Illinois. She enjoys learning about the sport and finding "new" water whenever possible. In addition to helping others fly fish; she likes to ensure that every client experience is about more than the fish. Gayle likes to teach about the flora, fauna, and wildlife experienced on each trip and has been known to even add in a little poetry to a trip when the time is right. Gayle is available to teach fly fishing to groups or individuals and guide clients on weekends. For Luke it was not only enough to call Columbus, MT home; he found the waters of the Stone and Stilly to be just as accommodating. Luke has lived his entire life in Yellowstone Valley, only leaving to earn a degree in education from Montana State University-Bozeman. Teaching is Luke’s greatest attribute, which is evident when his clients return with not only hands smelling of fish, but the experience and know-how to make fly fishing a lifetime hobby. Click here to see what our clients say, or check us out on Yelp and TripAdvisor!